As I write this, AirAsia flight 8501 has been missing for less than 24 hours, and in the absence of wreckage its too early to speculate on what happened. But the flight, which took off from Surabaya bound for Singapore, appears to have been traveling through an area of intense thunderstorm activity, so it may be instructive to look at the kind of danger this sort of weather can present to aircraft. crystals. The total amount of heat energy released when that much water is condensed amounts to approximately 3 x 1014 calories. Equated with known energy sources, this falls just below an entrylevel hydrogen bomb. Even a small thunderstorm would have the caloric equivalent of a Hiroshimatypeatomic weapon… The thunderstorm occupies a unique place in the pantheon of aviation meteorology because it is the one weather event that should always be avoided. Why always? Because thunderstorms are killers. 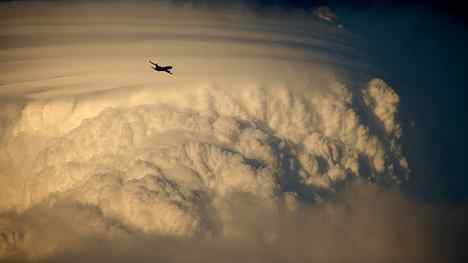 Some of the deadly forces include lighning, airframe icing, large hailstones, extreme turbulence, and downdrafts that can reach speeds in excess of 100 mph. Perhaps the greatest hazard facing a modern airliner, however, is the sheer volume of precipitation that a thunderstorm can put out. The event was not unique. Nine months earlier, an Air Europe 737 descending through rain and hail over Thessaloniki, Greece, had suffered a double flameout. In that case, the crew managed to restart the engines and land without trouble. In 2002, a Garuda Indonesia 737, also descending among thunderstorms, suffered a double flameout over Java. Its crew ditched the airplane in a river; one person died, and there were a dozen serious injuries. According to preliminary reports, the pilot of QZ8501 had asked air traffic control for permission to ascend from 32,000 to 38,000 feet in order to evade the weather. Historically, however, attempting to fly over a thunderstorm has proven a dangerous strategy. In 2009, Air France 447 was flying through the upper reaches of a thunderstorm when it hit turbulence and its pitot tubes froze, leading to loss of airspeed indication; in the ensuing confusion the pilot flying lost situational awareness and flew the plane into the ocean. Narita -> Shinjuku -> Matsumoto is a train ride I have taken perhaps 50 times or more. Seiko Epson in Matsumoto was one of my biggest customers at one time – HW, SW, and joint R&D stuff. Wonderful country and wonderful memories. I was always amazed how people could glide past each other in Shinjuku station without a hint of jostling or shoving. Would never happen in the US. I was also always fascinated looking down into people’s back yards and seeing how efficiently the space was used to grow things etc. The food in Japan also appeals to me very much. We have some great Japanese restaurants in the Bay Area, but the presentation and the ambiance are just not the same. Can it be said definitively that the plane was communicating *directly* with the Inmarsat satellite after the unexplained SDU logon (i.e. from 18:28 onward)? Nihonmama: You know how to play to me, of course, with riddles that bear no question marks. And so I will answer you in return through That which shines forth from behind the words, so as to offer assurances that, yes, I can see you. The rocks in the waters of the Kamogawa had a message for me to pass to you: you returned to the US too early, and it is this that has manifested your dissonance. Time to return Home? Latest leaked data from Gerry S. puts 8501 about 20NM further west of my previous estimate. Disregard Post at January 1, 2015 at 12:42 AM. Typo corrected in this link. Thanks, Richard, for noticing the fuzzy digit error.